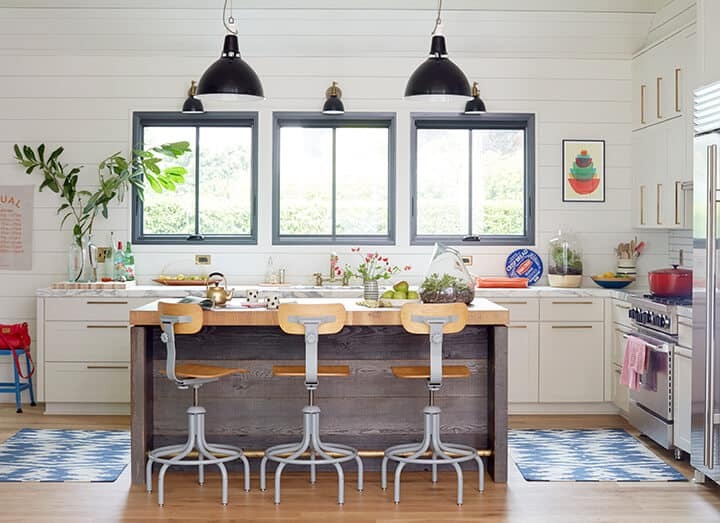 The kitchen is the heart of the home and that heart just might have an attack this year if the trend gods were designing it. It’s pretty darn exciting, if ‘exciting’ is what you are into. 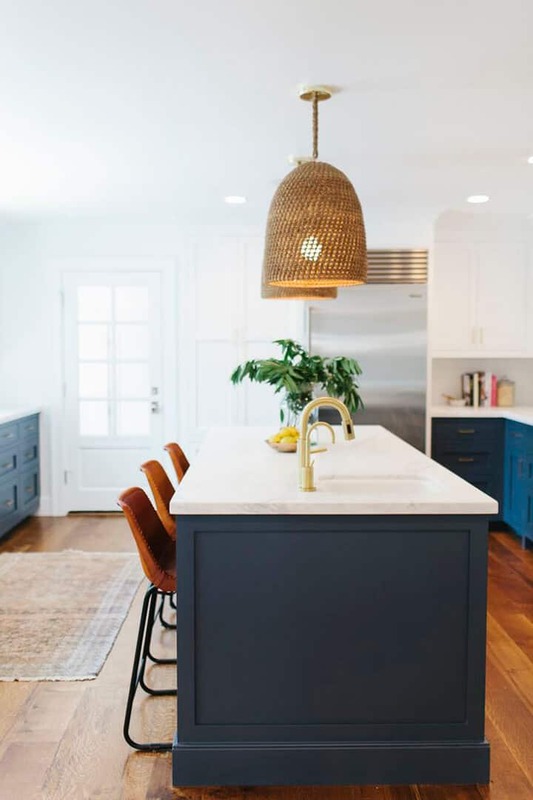 Here are some of my favorite kitchen trends (both new and resurrected) and how I feel about them, including how long I think they’ll last. 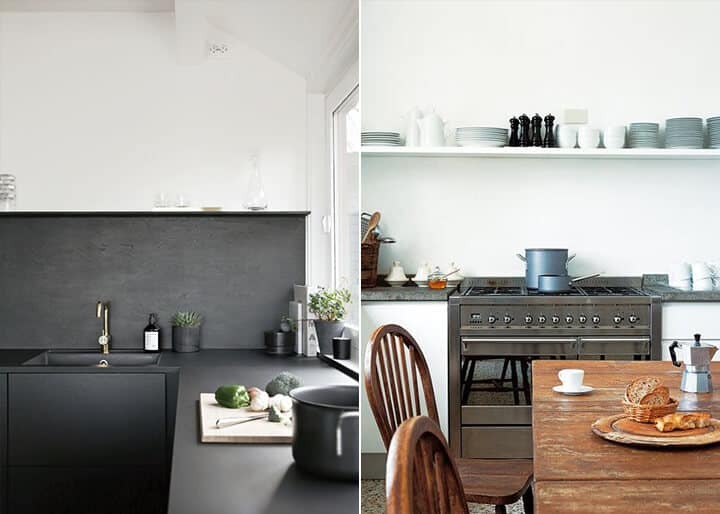 Longevity: Make sure you can handle it and that your kitchen is bright enough before you go black. I think for resale you are taking a risk, for sure, but I also think that black is a color that doesn’t go out of style, especially in cities. 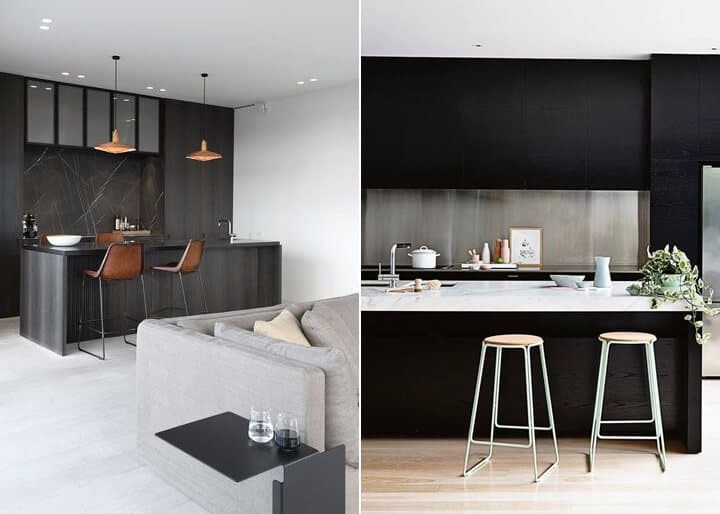 Make sure it’s big and make sure it does’t go too ‘bachelor pad’ with the rest of the furniture and accessories. If you are worried consider doing it just on your bottoms (cabinets, that is). Or hey, just paint an accent wall. In other words I think that this has 5+ years of longevity. Organic Woven Basket Pendants: Organic and woven pendants are everywhere, especially over an island. 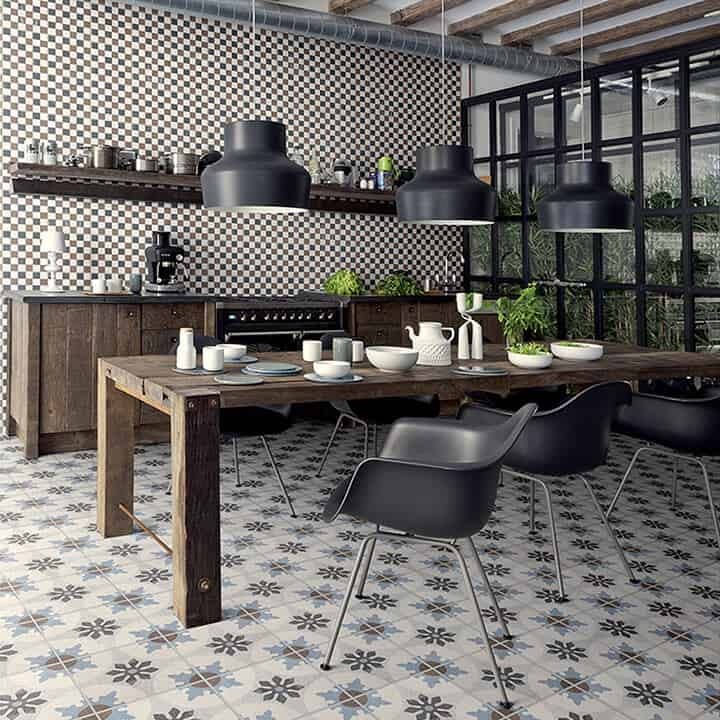 They are not new to the game, but they are getting some updated lines, shapes, and tones which help to break up the all the hard surfaces that tend to be in the kitchen. Generally they are very affordable, which makes it an easy trend to jump on board with. I love this trend and am all about it. We even did our own DIY version a while back which I still love. Longevity: The bolder and more colorful (or on-trend) the less years you have to be hot. I think this trend has legs, but it will continue to become more and more ‘normal’ every day, so be careful. At the same time these age so well that they can look original and new to the house really fast (in a good way). The more hand-painted the longer they’ll feel beautiful. 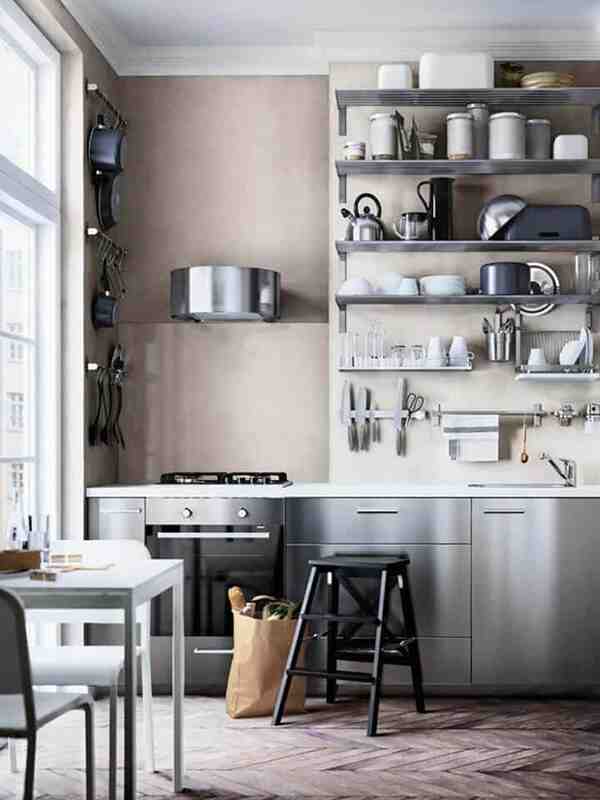 But no matter what, they add serious personality to a kitchen. 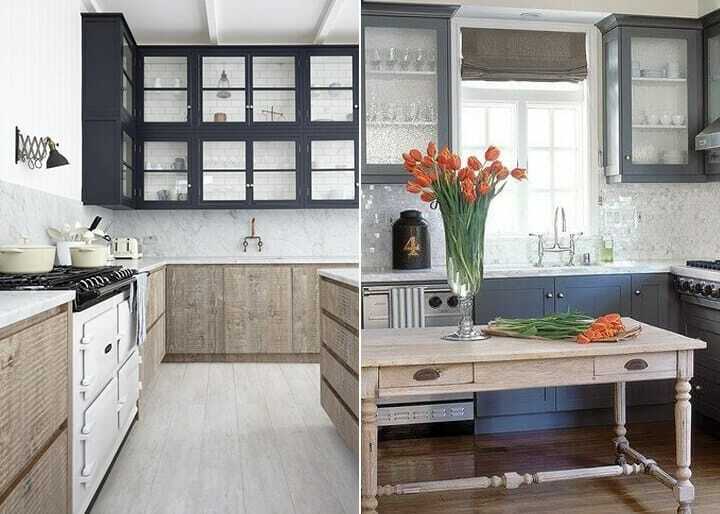 Glass Front Cabinetry: Certainly not a strictly 2016 trend, but its one that you should certainly think about to help you make your kitchen feel bigger – plus it helps break up the uppers from the lowers. Warning – that means you have to own pretty things, then put them up there and keep them looking all magazine -perfect. 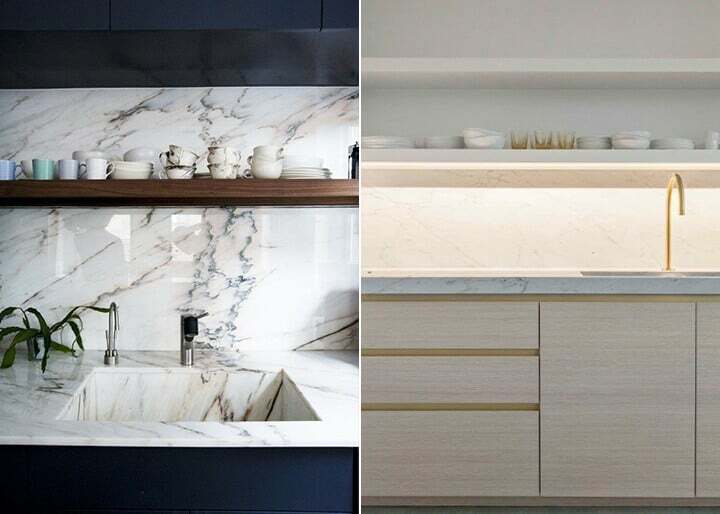 Marble: Carrara or Carrara wannabes were and continue to be VERY popular in 2016. 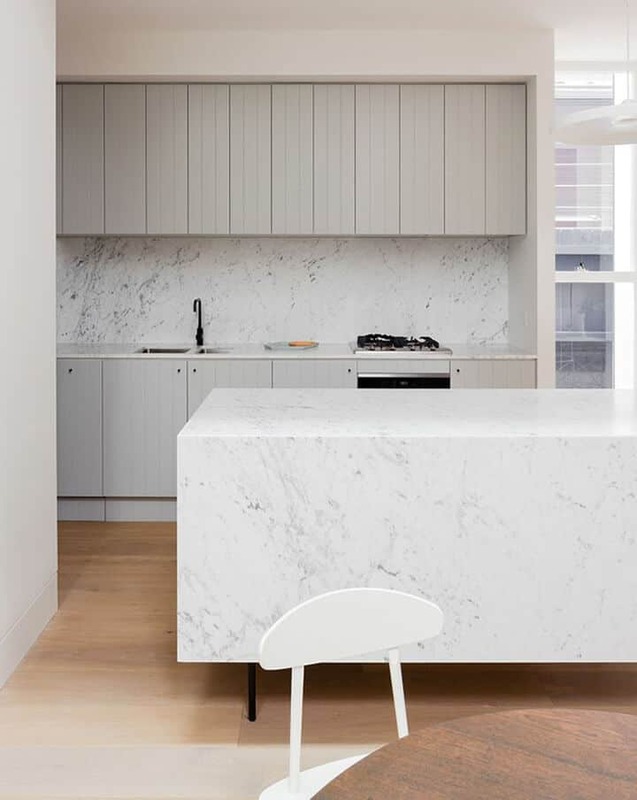 An all white kitchen may not be for everyone, and marble did take a backseat (or backsplash? ha) in the last 10 years as it is not the most durable of materials. 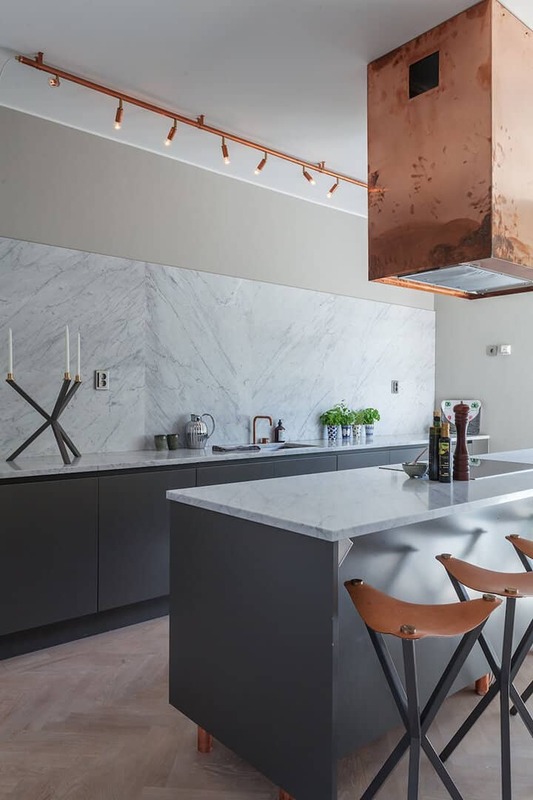 But, with all of the new options out there you can get marble (or the look of marble) to suit your style and kitchen needs. 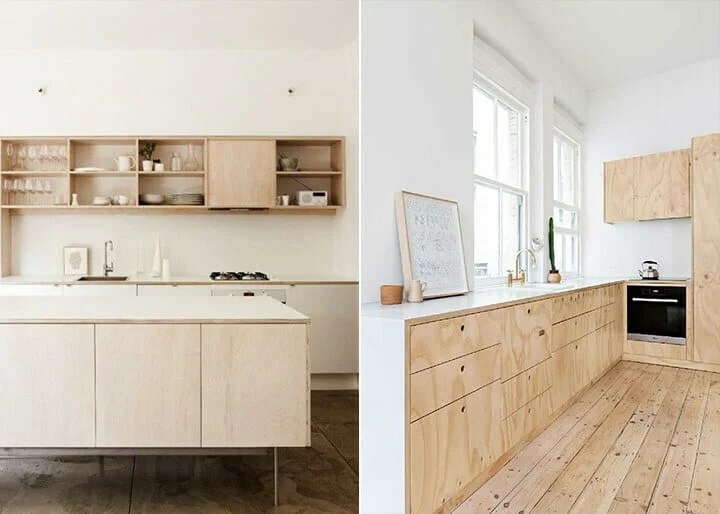 Plywood: Plywood throughout the home was big in modern design in the 80’s and 90’s and is now seeing a new fresh take in the kitchen. 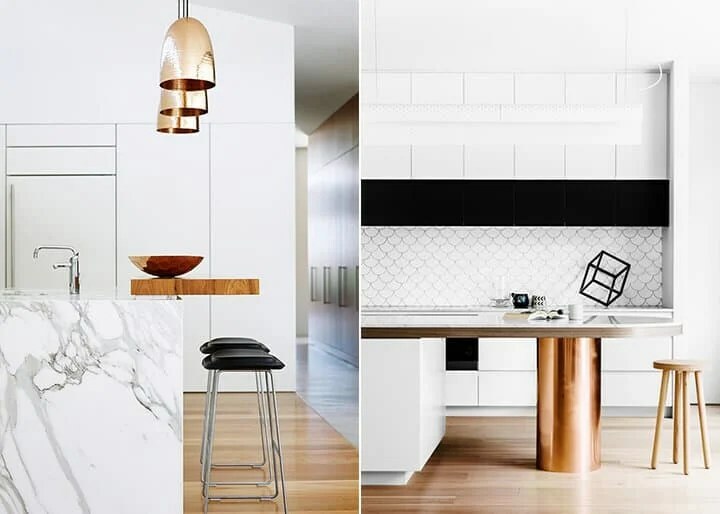 Yes, we get that this may not be for everyone but for the right house, the right setting, and the right space it is very chic and can be very affordable. One Shelf: My eyes say YES, but my functional mom-brain that knows I need a place to stuff sippy cups, bottles, and mismatched bowls says NO WAY. 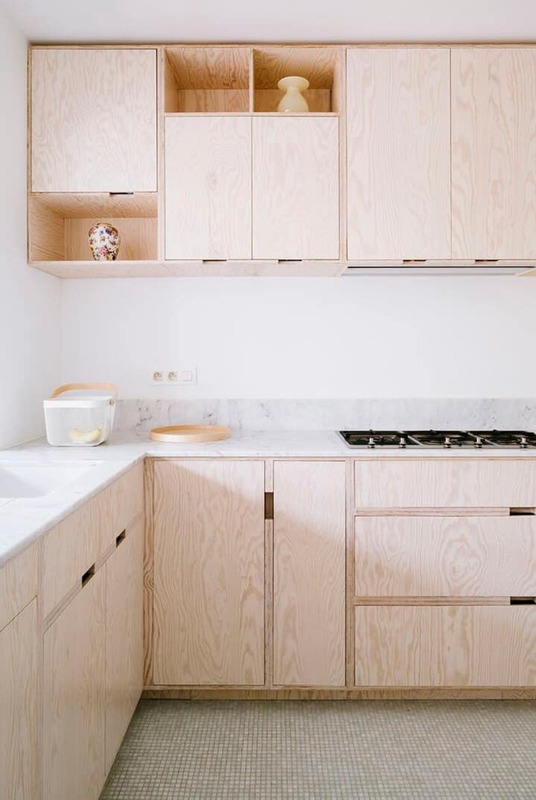 If you are a minimalist, can keep things clean and know how to put things back in their place like a proper human being should, then this trend could work for you. But, if you open up your kitchen cabinets and an avalanche of tupperware covers you then I would say steer clear of this one. 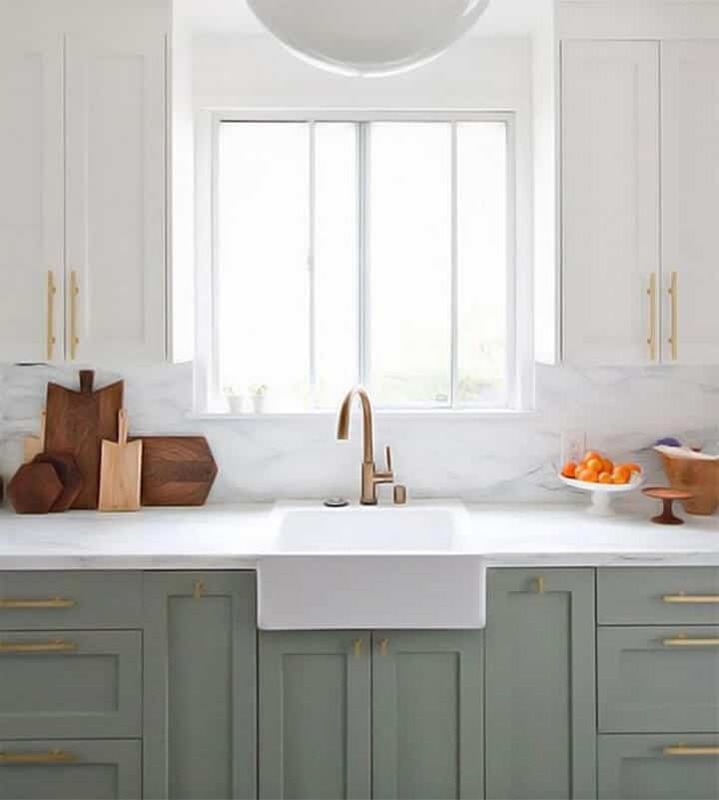 Two Tone Kitchen Cabinets: The two-tone or tuxedo style cabinets became very big a few years ago and then fell onto the back burner for a bit (look at all these kitchen puns we have going on.) But we are starting to see them bleed back in ferociously and with very swoon-worthy results. The trick to making this trend work is by having either the tops or the bottoms in a totally neutral color. In other words if you know you want navy blue bottoms then stick to white/grey/wood tone on the uppers. Balance is key in this trend. I even adopted this one into my own kitchen. 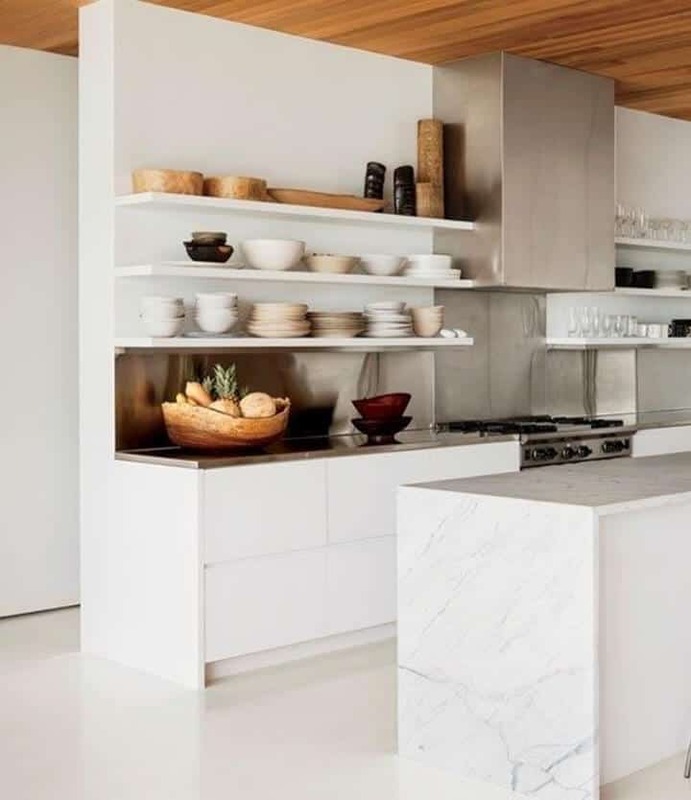 Open Shelving: Certainly less new, but this trend falls in the same family as the one shelf trend you saw earlier in the post, although this one actually requires a bit more work, if you can believe that. 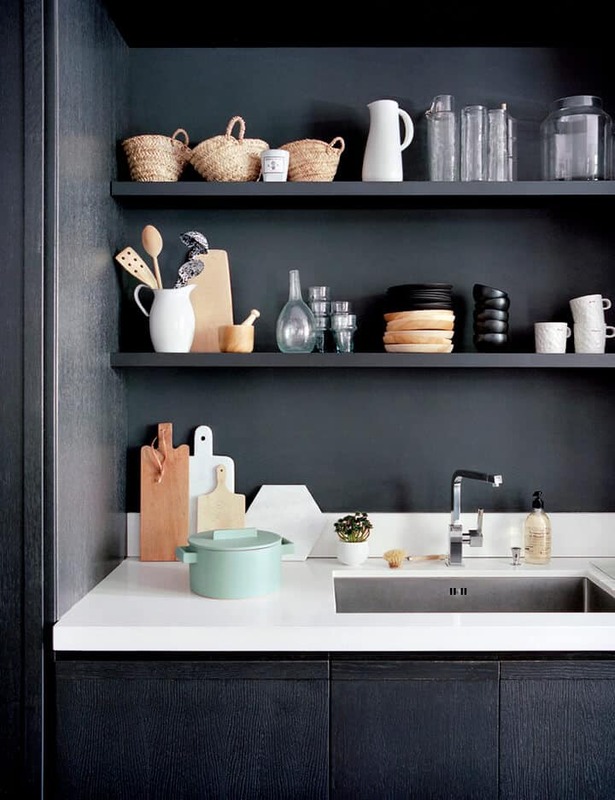 For the open shelving concept to work you not only have to be a clean person, but you have to keep all your dishes and items you are displaying in a strict and minimal color palette. If you are the person that has one cup from every place you have visited and a collection of vintage mismatched china this may not be the trend for you. 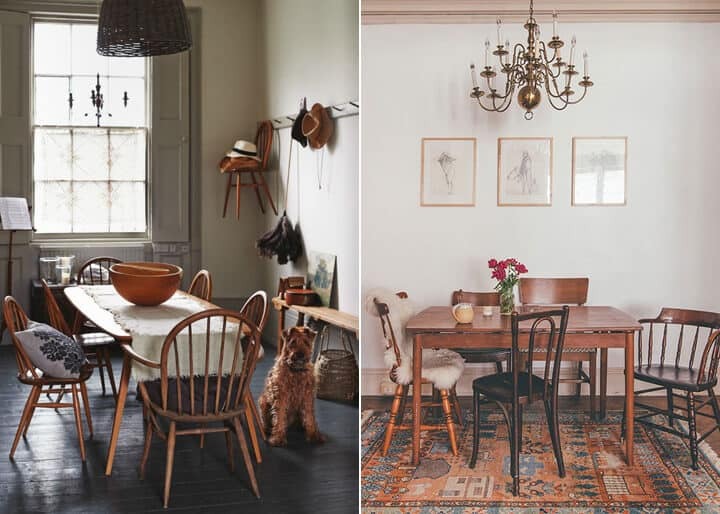 Shaker/Farmhouse/Windsor Style: This trend is a true blast from the past as America’s primitive past. 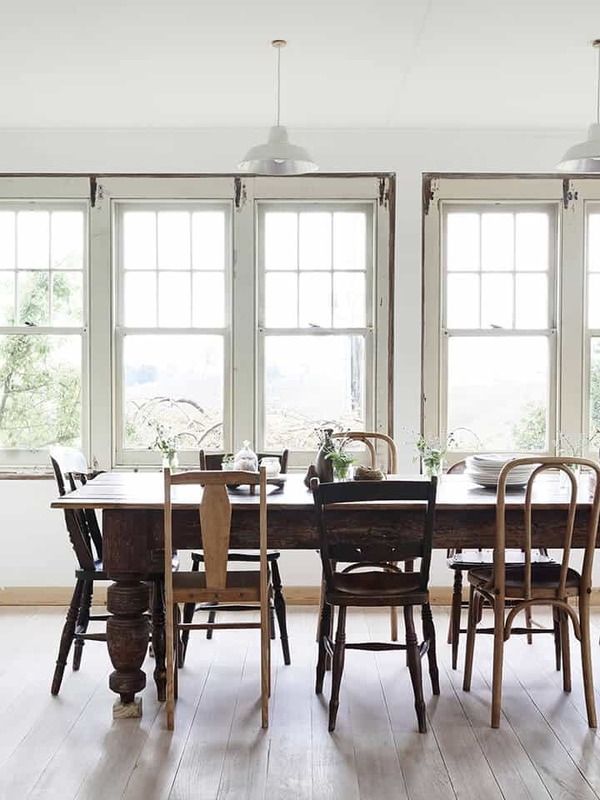 The very first kitchen/dining rooms had exactly what you see below, a collection of mismatched and shaker/farmhouse style chairs around a big table. It is all about gathering and family with this trend. It may seem easy to adopt as you think you can just head out and grab a few mismatched chairs and throw them around your table. But, it does take a little more thought than that. To keep it from looking too thrifted, keep the chairs to one or two colors or tones and stay away from mass produced or anything too generic. 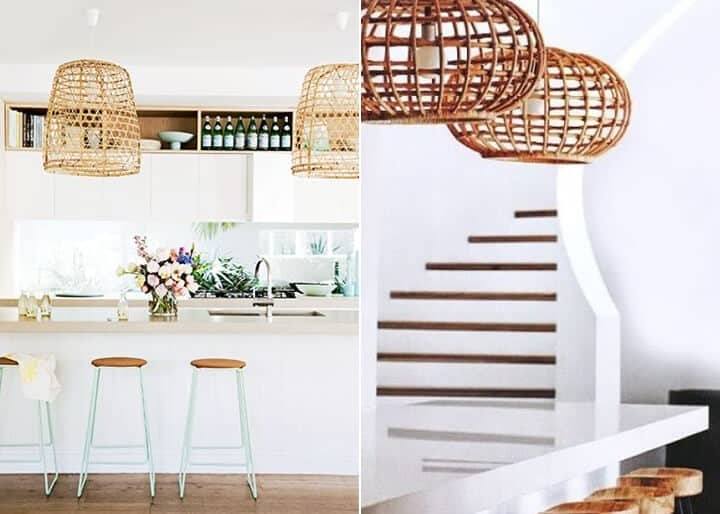 The more simple, classic and antique the chair the better and if you have a basket collection on your wall consider yourself ahead of the trend. 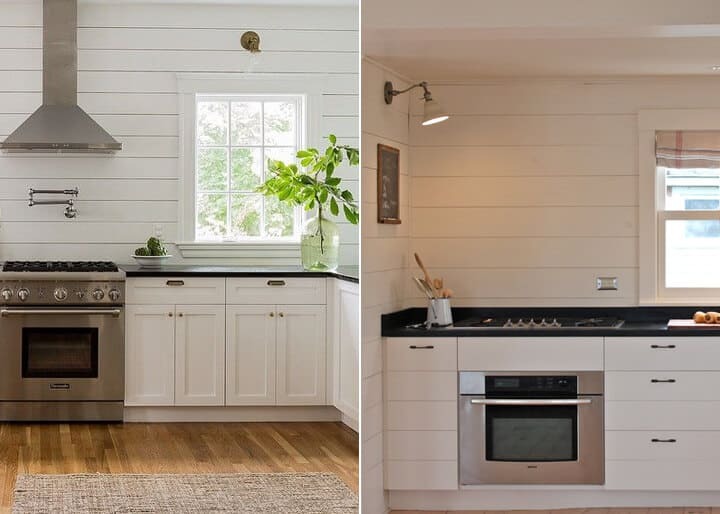 Shiplap Walls: This trend hit big during the 90s when everyone seemed to want a little piece of Cape Cod in their home and this year we are seeing some updated versions. 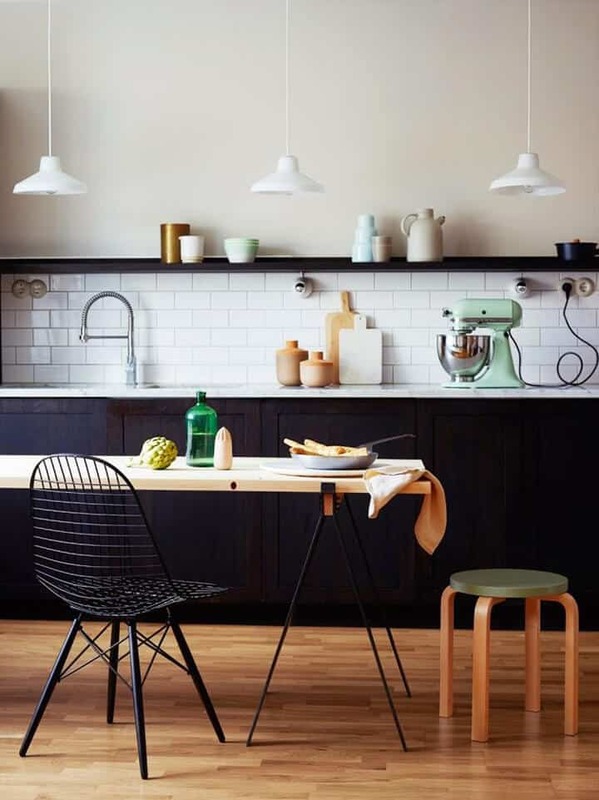 To keep it from leaning too traditional add some modern elements in with your appliances, lighting, and accessories. I for one love this as its just a beautiful and simple texture (A STRIPE!!) on the wall. Nobody has ever been offended by subtle stripes by way of a texture. Longevity: Metals for me are one of those things that will always stay in style, so if it is done right I give it quite a bit of life ahead of it. Chrome and Stainless Steel: Silver has taken a major backseat the last 10 years – like the back seat of the bus. But its always been a mainstay in the kitchen that is gaining even more traction this year. 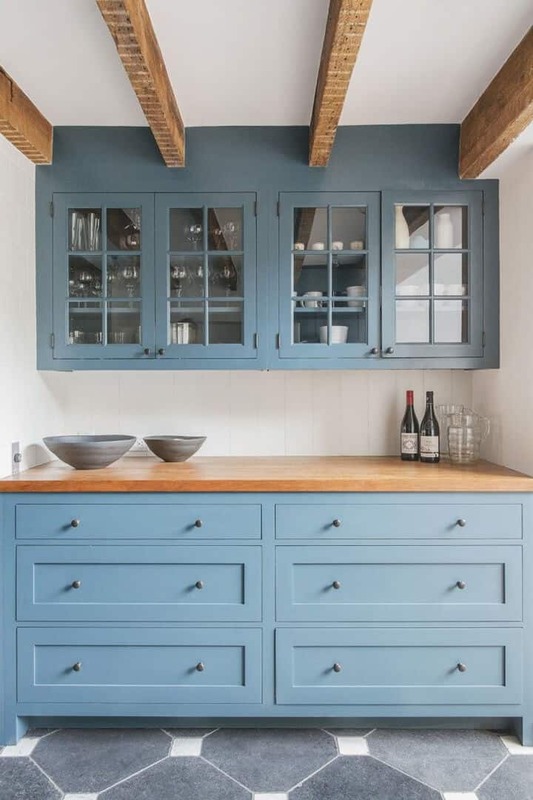 Stainless steel cabinets are back (for the right house) and looking better than ever when paired with organic elements and warmer tones (although I’m secretly still scared). 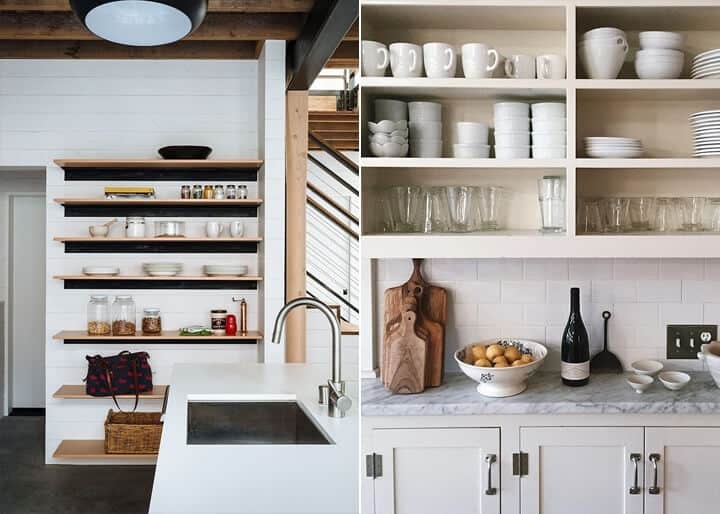 To keep it from going to hospital/surgery room make sure you bring in life to the kitchen through some warmer wood tones, natural elements, or a pop of color. What are your favorite trends? What are you ready to adopt or what do you think should already go back in the grave? 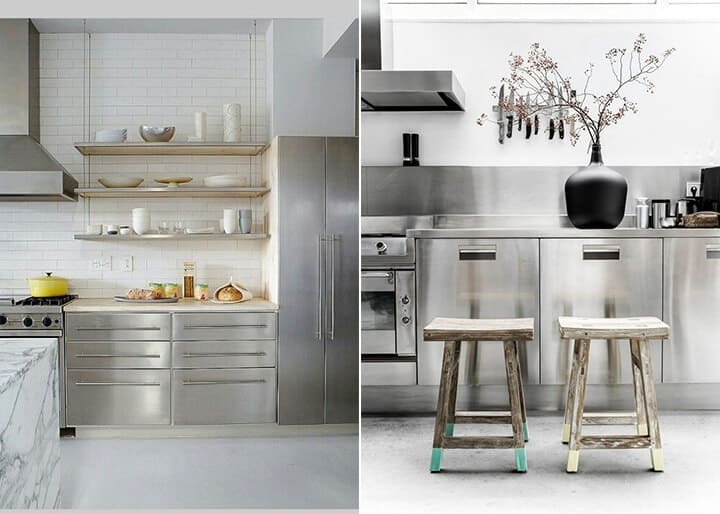 Could you handle stainless steel cabinetry??????? 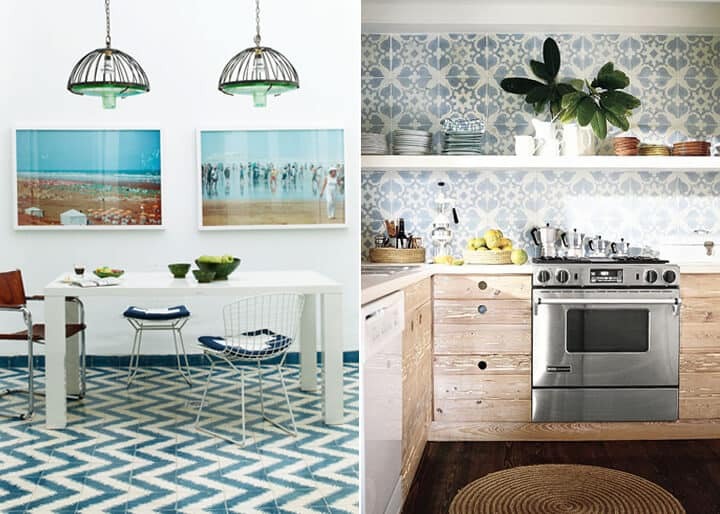 *Craving some more of my color and trend predictions for this year? Stay tuned for a new series where we will show you our predictions for color trends this year and how you can bring them into your space. In the meantime check out these 90’s colors that have made a comeback in the design world. 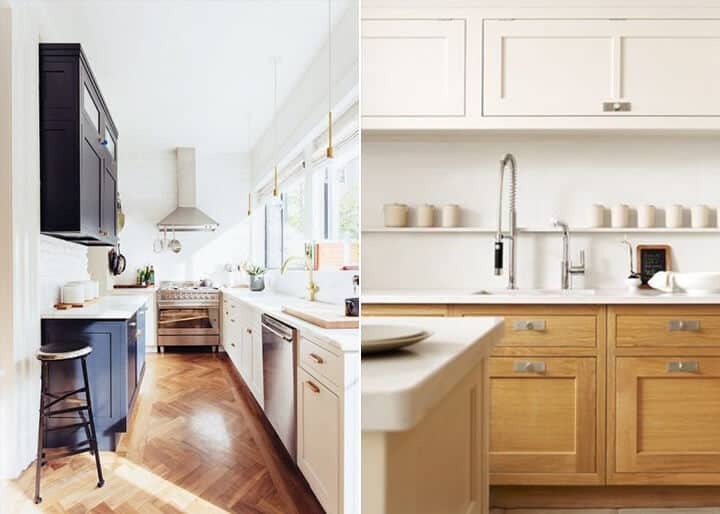 The post 13 New Kitchen Trends And My feelings About Them appeared first on Emily Henderson.